WFLAHoward interviewing on Miami station WFLA. Melissa Howard, who was running for a seat in the Florida House of Representatives, admitted lying about having a degree. She posted an image on Facebook of herself posing with a certificate, but it was falsified. While Howard did attend Miami University, Ohio, she never graduated and doesn’t hold a degree. Initially she planned to ride out the bad publicity, but withdrew on Tuesday . A Republican politician has pulled out of a state election in Florida after she admitted faking her degree certificate. 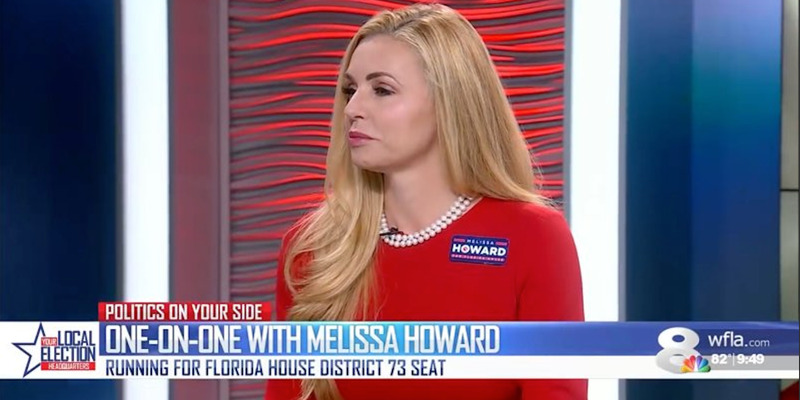 Melissa Howard, who was running in the GOP primary to contest a seat in the Florida House of Representatives, was called out for falsifying details of her time at college. Local news outlet FLA News Online broke the story. It had asked repeatedly for proof of her alleged qualification – a degree in marketing from Miami University in Ohio – and were initially ignored. Eventually Howard posted a photograph to Facebook (since deleted) of herself sitting on a sofa holding a large certificate which appeared to be her degree. While Howard did attend Miami University, she never graduated – and officials from her alma mater pointed out discrepancies with her claim. A spokesman told the Sarasota Herald Tribune Howard’s major was not in marketing, as per the certificate, but in retail. Miami University said it has never offered a marketing major. On Monday she apologised and said she intended to stay in the race, but by Tuesday Howard backtracked by pulling out. Howard said: “The right thing to do for my community is to withdraw from the race. I will do so today…I made a terrible error of judgement…I am deeply sorry,” she said to WWSB in Florida on Tuesday. Joe Gruters, State Representative and Howard’s campaign treasurer, told Florida Politics: “She made the right decision and saved the community and the party any additional heartache,”the Bradenton Herald reported. The district’s primary is to go ahead on August 28. District 73’s Tommy Gregory (R), a Sarasota attorney, will contest the election. Liv Coleman is the Democrat candidate for the Florida seat. There is no clear favourite at the moment.